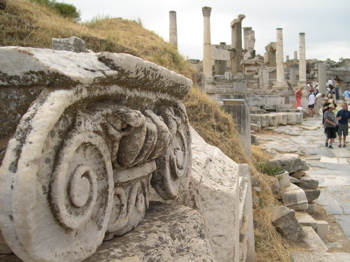 "Ephesus Travel - Cruisers' tips for getting to Ephesus from the port of Kusadasi". 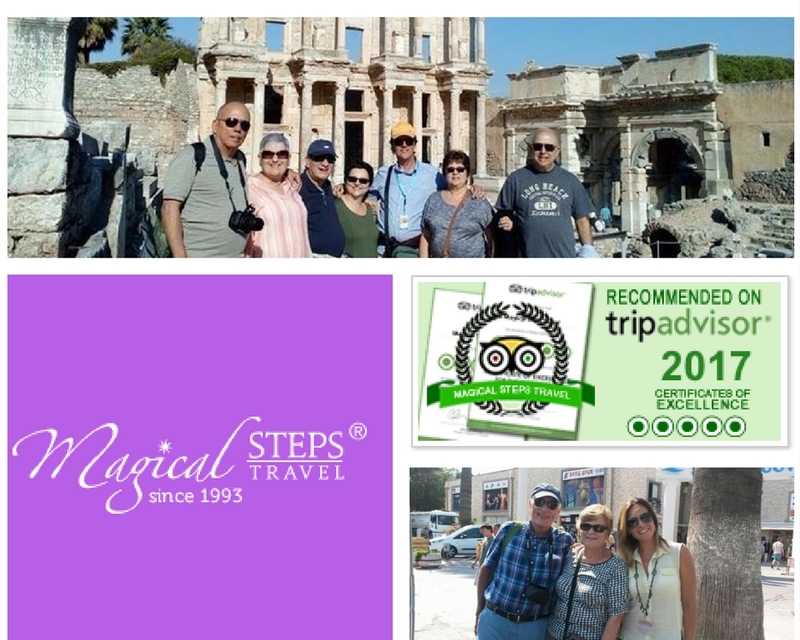 There is one thing all DIY cruisers agree on when it comes to Ephesus travel and getting to Ephesus from Kusadasi cruise port: you should have a professional guide when you’re seeing the Ephesus ruins, in other words, take one of the daily Ephesus tours! Travelling half the world round and getting there without a guide to explain what you are seeing is pretty much a waste of time! Back in the Roman times, at the time of its highest peak, Ephesus is considered to have had over 250,000 inhabitants. It was the fourth largest metropolis after Rome, Alexandria and Antioch. Although only one tenth of the Ephesus ruins have been unearthed in the past century of excavations, walking around it on your own and understanding what’s going on there is not an easy task. Technically, there’s not much involved when it comes to Ephesus travel… the site of Ephesus is only 19km (about 12 miles) away from Kusadasi harbour. A mere 20-25 minute ride. So why get on one of the Ephesus tours? You could easily spend a couple of days exploring this grandiose excavation site, and if you get there on your own...what might happen is you won't be able to see the trees from the forest. That's how much there is to see. And we all know, as a cruiser your time in port is quite limited. That’s why it’s important to be with someone who is going to make your visit to Ephesus time-effective by presenting the essence of this amazing place and putting things into perspective for you. Guides’ explanations will definitely enhance the enjoyment of such an important historical place. That’s why we really do recommend you take one of the Ephesus shore excursions, whether it’s one you can book onboard your Mediterranean cruise ship or one of the private Ephesus Turkey tours you can book online. If you have decided you won’t need a tour guide to take you through the Ephesus ruins, yes, it is possible to take a bus there. 1. First, take one of the white mini-buses, the so-called dolmuses, to the Ladies Beach. They depart from the main road of Kusadasi as you exit from the Kusadasi harbour area. You can hail them anywhere on the road and will see the sign with the destination on them. Dolmuses take up to 15 people at a time and depart as they fill up. 2. Get off at the Friday Market Avenue, cross the road to catch another dolmus to Selcuk. They leave every half hour or so. The ride takes about 30 minutes. The cost is approx. 3 Turkish Lira. 3. At Selcuk, take another mini-bus to the entrance of Ephesus arceological site. The ride takes about 10 minutes. NOTE: Dolmuses will take either US$, Euros or Turkish Lira. However, at the site entrance they will take Turkish Lira only. You can obtain Turkish Lira at an ATM close to the port of Kusadasi. 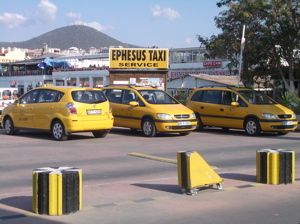 It is possible to take a taxi from the Kusadasi harbour to Ephesus. You will find taxis parked right in front of the Kusadasi Scala Nuova port complex. Before you jump into one of the taxis you should agree on a price. Also, agree on whether you want the taxi driver to simply drop you off or wait for you to take you back to town. Make sure your taxi driver will be waiting for you at the exit on the other end of the excavation site, so you don’t have to walk 2 km back to the entrance. We also suggest you pay the taxi driver the whole amount only once you get back to the port. You shouldn’t pay more than €50 per taxi to go there and back, with a wait. But then again, we suggest paying a little more and getting one of the Ephesus private shore excursions with a professional guide. One thing with taxi drivers you catch in front of Kusadasi port is, you never know how proficient their English will be. Another thing is you could always end up being taken to shops you don’t really want to go to. Also, remember a taxi driver is just a taxi driver, not a tour guide. If you’re going to have one, hire a professional tour guide. Like the Ephesus travel page?